I don’t understand the left’s myopic fixation on income inequality. If they genuinely care about the less fortunate, they should be focused on policies that produce higher incomes. But instead, they agitate for class warfare and redistribution, which leads me to believe that many of them hate the rich more than they love the poor. And while it’s surely true that governments can harm (or worse!) the financial status of folks like Bill Gates, that doesn’t help the poor. Indeed, the poor could be worse off since statist policies are linked to weaker economic performance. So relative inequality may decline, but only because the rich suffer even more than the poor (as Margaret Thatcher brilliantly explained). That’s a bad outcome by any reasonable interpretation. But let’s set aside the economic issues and contemplate the political potency of so-called income inequality. Writing for the Wall Street Journal, William Galston of the Brookings Institution (and a former adviser to Bill Clinton) opines that income inequality isn’t a powerful issue in America. Hillary Clinton was reportedly struck that no one had asked her about inequality. She shouldn’t have been surprised… Recent opinion surveys show inequality well down the list of public concerns. In a February CBS News poll, for example, only 4% of Americans named income disparities as the most important problem facing the country. In March only 2% told Gallup that the income gap was at the top of their list. Galston cites a couple of studies of public opinion trends. In…Public Opinion Quarterly in 2013, Matthew Luttig also found that rising inequality has failed to boost support for redistribution and may actually have the opposite effect. What is going on? The authors of the Brookings paper found that the principal beneficiaries of government programs—especially the elderly—have become increasingly resistant in recent decades to additional redistributive policies. During that period, just about every new cohort entering the ranks of the elderly has been less supportive of redistribution than its predecessor. He doesn’t think voters necessarily are becoming libertarian or conservative. But he does think leftists are deluding themselves if they think more propaganda will sway voters in favor of redistribution. Many Democratic activists believe that the weakness of public support for redistribution rests on ignorance: Give them more information about what is really happening, and their policy preferences will be transformed. But a recent paper for the Washington Center for Equitable Growth reported that while survey respondents “who view information about inequality are more likely to believe that inequality is a serious problem, they show no more appetite for many interventions to reduce inequality.” The best explanation for this apparent anomaly: rising mistrust of government, especially the federal government. Many people who think inequality is an important problem don’t believe that Washington’s political institutions can be trusted to fix it. Gee, I wonder why people think the federal government is incompetent in helping the poor? 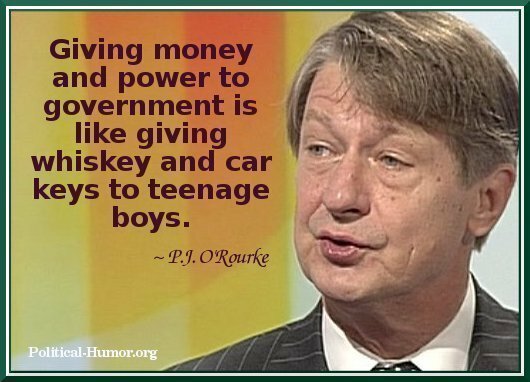 Could it be that voters are slowly but surely realizing that P.J. O’Rourke was right? In any event, Galston concludes with some very sound recommendations. What matters most is growth that includes everyone. To get that kind of growth, we will have to act on a broad front to expand opportunity for those who now lack it—and ensure that workers earn enough to provide opportunity for their children. These measures will reduce inequality, all the more so if they are financed by linking real wages to productivity gains and terminating tax preferences that don’t promote growth while benefiting mainly the wealthiest Americans. To be sure, Galston’s embrace of growth instead of redistribution doesn’t mean he has good ideas on what causes growth. But at least he understands that the goal should be to make the pie bigger. And that’s the point I made in this CNN interview, which took place via Skype since I was at a conference in Brussels. Though you may notice that I mangle my metaphor at the end of the interview, switching from pie to cake. But setting aside that one glitch, I hopefully got across my main point that the focus should be growth rather than inequality. P.S. It’s worth noting that states with the most support for class warfare and redistribution also are the states with the most inequality. Maybe they should experiment with bad policy inside their own borders before trying to foist such policies on the entire nation. P.P.S. I wrote last year about six remarkable examples of leftist hypocrisy. Make that seven. Yes, yes, thank you. Someone else agrees with me on this. You just took my thoughts on income inequality and put it perfectly into a well-written post. Progressives like to think of themselves as world citizens, so let’s make everyone in the world equal. We can start by cutting welfare to 1/3 of what they currently receive. They want to take from those who have produced goods and services that people want. Somehow it is greedy to want to keep what you have produced, while it is not greedy to steal from others through the coercive power of government. VioletRoseGold, just paste “https://danieljmitchell.wordpress.com/2015/04/22/the-lefts-inequality-fixation-is-economically-foolish-and-politically-impotent/” into the status box at the top of your FB page. Piece of cake. why can’t I post to FB? I would add one additional aspect, though: You cited polls, and the CNN interview was about analyzing poll results. But how well do you think the pollsters are able to reach the segment of folks we call the “Low Information Voters (LIVs)?” I would love to see how the LIV segment of citizens poll on these questions about income inequality, and where they would prioritize that issue amongst their other concerns. The reason I point this out is because my gut tells me the LIVs are much easier to dupe into buying the phony conclusion that a “wage gap” can only be remedied by redistribution. If the LIVs are >5% of likely (or even possible) voters, then of course the liberal politicians and pundits are going to dust off the tried-and-true rhetoric of income inequality. They’re so practiced at it, why not? Finally, as a blogger I try to find new effective ways to phrase economic concepts that might be less “stand-offish” to centrists and mildly liberal readers, I have begun to worry that using the word “wealth” in ANY way is counterproductive. Economists (you) and people who have read a lot about economics (me) tend to use the word “wealth” clinically, as in the “creation of wealth” and Adam Smith’s “Wealth of Nations.” But to the left, the word has an emotion-based distaste. That visceral reaction to the word “wealth” is what makes it so easy for the left to keep alive the bogus assertion that “trickle down economics” doesn’t work — as Rana Foroohar did at the end of that CNN segment. I also noticed that one of the host’s questions (at the 3:10 mark) to you was: “Don’t Republicans (pause — with a distraught palms-up hand gesture) feeeeeel that?” CNN hosts, as typical in the liberal media elite, seek to perpetuate/amplify the compassion gap between Republicans and Democrats. To understand how counter-productive the left’s emotion-based economic policies are, a curious voter has to dig beyond the superficial layer and understand the logical chains of cause & effect & cause & effect, as Thomas Sowell’s sub-title of his Applied Economics book — “Thinking Beyond Stage One” — exemplifies. I’m curious what your view is of my growing hesitance to use the word “wealth” in my articles where I’m trying to reach liberals and change their minds. The shrinking pie example is flawed. The pie IS getting bigger, even under statism. After all, even France is growing along what seems to be a 0.5% trend line, or so. The relative decline problem is that others, and hence the world as a whole, are growing much faster. The luxuries of today, are quickly spreading and becoming tomorrow’s staples. In food analogies, today’s caviar becomes tomorrow’s pizza. Having a bigger slice of a slightly bigger pizza, when the entire world has access to pizza and many other jurisdictions have moved on to chaviar, will be a miserable outcome of failure and decline. The average voter lemming fails to realize how much more powerful and sophisticated human life will be a couple of generations from today (like chaviar vs pizza). If you’re still eating pizza in that future world, even a bigger slice of a slightly bigger pizza, when most other humans have moved to chaviar will be an unexceptional wretched outcome. This is a long-long way from today’s American voter lemming’s position where he is eating a slice of the biggest pizza on earth, in a world where most other people are comparatively starving. But this relative and very real decline is the future the American voter lemming is setting himself up for. Because a redistribution dollar today is more appealing to the voter lemming majority than five perpetually compounding growth dollars tomorrow. Even if, compared to the rest of the world the “average” American voter lemming is today in the world’s top two / five percent. The American voter lemming is thus on a mission to destroy the very engine of his exceptional worldwide wealth: Inequality of outcome and less adulterated effort/reward curves. Envy used to be considered an ugly thing. The left is elevating it to a virtue. It is a small, nasty, destructive thing. No good comes of it.